Stephen Glass (Hayden Christensen) is a promising young reporter and assistant editor on The New Republic, a Washington-based magazine boasting an 80-plus-year heritage and ‘in-flight’ status on Air Force One. He has managed to gain popularity and acclaim within the magazine, as well as in his freelance career elsewhere, for providing vivid, humorous anecdotal articles detailing the often absurd or dramatic. After online journalist Adam Penenberg (Steve Zahn) at Forbes Digital begins to investigate ‘Hack Heaven’, a Glass article on computer hackers extorting a software company, his career and journalistic integrity is soon brought into disrepute. This controversy occurs subsequent to a recent changing of the guard at The New Republic, where popular editor Michael Kelly (Hank Azaria) was ousted in favour of the less-experienced Charles ‘Chuck’ Lane (Peter Sarsgaard). Is Glass a victim of politics, has he been duped by his sources, or is he just plain lying? An admittedly abstract concern when adapting a true story about journalistic fraud, is that any dramatic licence taken with the material can be seen as fraudulent itself. Luckily, in the case of Shattered Glass, the scandal was heavily documented and transcribed, to the point where – at least, according to the claims of the supplied audio commentary – much of the events and dialogue is almost entirely verbatim. It’s an impressive feat to include so much direct pilfering of reality, without concession to a documentary or vérité format. Perhaps as a consequence, the more conceptual aspects of the story are less compelling, such as its framing device of Glass as narrator giving a magnanimous lecture to a classroom of high school students. Shattered Glass is screenwriter Billy Ray’s (erstwhile co-creator of science-fiction series Earth 2 (1994-1995)) directorial debut, which was followed in 2007 with the thematically similar Breach, starring Ryan Phillipe as a promising young FBI agent accused of spying for the Russians. Partly as a consequence, and partly given the largely office-based, dialogue-driven events, the production never really raises itself above ‘competent’. There’s nothing in the way of bravura performance or stylistic flourish, but there’s also no scenery chewing or distracting editorial trickery. It’s a vanilla piece, something very much befitting a story about truth, and the trouble one has in defining it. The ambiguity lies not just in whether Glass is telling the truth (something admittedly unlikely from the outset) or how much of his work is fabrication, but in what exactly motivates Glass. As his behaviour appears increasingly manipulative, how could he possibly justify himself? The question is far from resolved, though the likes of Soderberg’s The Informant! (2009) provide a more in-depth account of a similarly-addled figure. As an actor, it could be said that Hayden Christensen became something of a victim of circumstance; this is assuming one could claim ‘victim’ after starring in two of the most profitable films in history. Among numerous criticisms of the then-current state of the Star Wars franchise, Hayden was singled out for his poor acting and absence of charisma. Shattered Glass is his only credit between those two gargantuan tentpoles so, if little else, is able to claim back a certain credibility from Darth Vader’s steely grip. Hayden acquits himself admirably, channeling a sulky persona and oily, ingratiating charm suitably onto a man of dubious allegiance and legitimacy. Regardless, the real acting highlight is Peter Sarsgaard’s turn as Chuck Jones, the recently promoted editor-in-chief who takes over protagonal reins when the investigation gathers wind. He plays it cool throughout, with a wariness and resentment of Glass’ bourgeoning celebrity, alongside a quiet professionalism that doesn’t let too much slip. Beyond the ostensibly true events shown in the film, and their broad commentary on the nature of American journalism in the late 90’s, more intriguing is the depiction of the rise of modern media. Not much of Hollywood’s output has really addressed or tackled the tremendous sea change in communication over the past two decades. They’d still have you think everyone uses Bing, for example. Save for The Social Network (2010), the Hitchcockian scaremongering of The Net (1995), the cyber-anachronism of Hackers (1995) and a handful of other genre thrillers, little real hay has been made of the digital revolution and its myriad impact. It’s relatively subtle, but Shattered Glass at least makes distinction between the online journalists of Forbes Digital (who at the time faced an uphill struggle for legitimacy) and the relative complacency of The New Republic. The former can almost instinctively see through Glass’ story, particularly regarding the emails and websites he provides as corroboration. The conflict at the heart of the film can be read as between the analogue self-satisfaction of the past, and the digital efficiency of the present. Arguably, one can no longer hide our lies so easily, and the effect is profound. Shattered Glass does suffer in its transitioning of fact into narrative, and is a slight tale in the wider context of non-fiction cinema. The transition of protagonist from Stephen Glass to Chuck Jones is a little clumsy, plus the finale doesn’t contain the rousing catharsis that it seems to be aiming for. The story, however, is fascinating; the film does well in dramatising the events with coherence and fidelity. It also amounts to a compelling morality play and an intriguing character study of Stephen Glass, albeit one that unabashedly lacks a diagnosis. Over the next few weeks, I’m going to be doing reviews of all the films of Christopher Smith. I think he’s one of the most interesting directors working at the moment, and if there were any justice in the world he’d be getting begged by some studio to relaunch some superhero franchise with his own take on the world, front and centre. He’s survived working with Danny Dyer and has made some of the darkest and most entertaining films of recent years. First up, “Creep”. This film shares a few similarities with “Cloverfield”, in a weird way – in that we start off at a party and then the star heads off into the city and tangles with a monster. Admittedly, the one in this film is a little smaller, and there’s less cannon fodder here, but…no, that’s the end of that sentence. Franka Potente, oh lovely lovely Franka Potente, star of “Run Lola Run”, “The Bourne Identity”, and one of the few good episodes of “House”, is a slightly struggling model who we see at a party. That guy from a thousand adverts is a sleazeball admirer, so after getting hit on by him she leaves and tries to find a party where George Clooney will apparently be. A series of mishaps and delays later, and she finds herself in a remarkably empty tube station. One of the great forgotten classics of British horror cinema is “Raw Meat”*, where an increasingly inbred and deranged lineage of people lives inside an abandoned tube system, only venturing near the world of people when they need some food or a new woman to impregnate. It’s a magnificently creepy film (and features Edward Woodward’s greatest ever screen performance), and I think the majority of “Creep” owes some inspiration to the earlier classic. Christopher Smith mentions it in his commentary, but either he’s downplaying it because it’s his first film and he doesn’t want to appear to be just assembling his favourite bits of other films; or it’s a huge coincidence (he says he’d never heard of it when writing the film, but was shown it during production…I think); or that admitting he’d taken too much from it might have triggered legal issues. I think it’s a bit from A and a bit from B – I can believe he’d never heard of it, but he maybe was inspired by it afterwards, and made slight changes (there is an explicit reference to the earlier film’s “Mind the gap!” catchphrase, if memory serves). But I digress. “Creep” is this film’s mutated tube-dweller, and his origin…well, if you’ve seen it you’ll know, and if you don’t you might be bummed out I told you. Suffice to say, he’s not quite as human-looking as you or I, and he’s pretty upset about it. Franka is forced into his world by an unexpected and entirely unwelcome revisit from Gropey the Advert-Man, and the film then becomes two different films, in a way – we get her journey through the tunnels, attempting to get back to her own world; and we get Creep, and the life he’s carved for himself down there. For a first film, I think this is great. A sensible move is setting it somewhere that people just find unsettling anyway – the late night world of the London Underground. Half his work is already done for him, and for those people who’ve passed one of the disused stations on the tube and have pondered what could have made its home there, it’s even creepier. Franka Potente is great, of course, as is the circular nature of her journey (more on that in my reviews of his later films), and the way the film approaches Creep’s character is pretty damn clever too. It’s not perfect. As you may have gathered from the earlier paragraphs, I think it “stands in the tradition of” a few other horror films, and it’s a little…slight. I think most other directors would be delighted to have this under their belts, but Christopher Smith just kept on getting better. For those people reading this, I’d really recommend watching “Severance”, “Triangle” and “Black Death”, so when I inevitably spoil something quite important in one of them, none of you will be upset. *Well, by forgotten, I clearly mean “mentioned on this film’s Wikipedia page, just under a different title”. One of my all-time favourite films is based on an Edgar Allan Poe story – “Masque of the Red Death”, made by the great Roger Corman (no doubt immediately before and after a pair of rubber-suit-monster films). It uses colour in a fascinating way, everything is overloaded with it like a William Eggleston photo and Poe’s prose is matched beautifully to Vincent Price, Jane Asher and the rest of the cast. In fact, just writing about it makes me want to go and watch it again. This is all the Spanish I know. Or is it Italian? “The Raven” is unlikely to dislodge “Masque…” as the favourite film featuring or based on Poe, in the minds of many viewers. 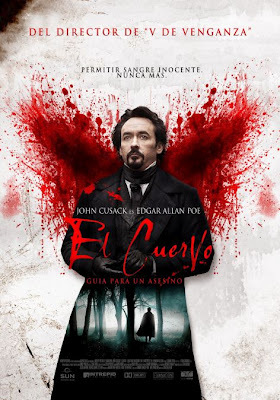 John Cusack plays Poe as a sort of over-dramatic, slightly camp alcoholic…he may very well have been all those things, and was certainly the last, but it doesn’t quite ring true, and feels slightly out of place. It does calm down a bit later on, or maybe I just stopped noticing it so much, though. Amazingly, the introductory crawl seems to be fairly close to reality. He was discovered in the street, delirious, wearing clothes that weren’t his own, and died in hospital (the film shortens this to having been discovered on a park bench, with the last three weeks of his life a mystery). It weaves in real biographical details and spins a pretty interesting story from them. Poe made virtually nothing from sales of his poems and stories while he was alive, and it shows this alongside a sympathetic newspaper editor who tells the policeman ( Luke Evans, Zeus from “Immortals”) that Poe has the spark of genius, damped by melancholy, something I’m guessing he heard too little of during his life. He’s popular enough to have a fan, though, who’s organising copycat murders based on Poe’s stories. We find this out a little before the characters do, although if you’re a Poe fan you’ll have guessed from the very beginning. Well, if you’re a sentient human you’ll have just read it on the back cover of the DVD, but I’m attempting to maintain that little illusion. Alongside these murders is a converging plotline with the beautiful Emily Hamilton (played by Alice Eve), who Poe plans to secretly marry. Her dad, a little on the rich side, amazingly doesn’t approve of a penniless lush marrying his daughter, but the tension between them eases when the murderer and Emily’s plotlines converge. “The Raven” could be boiled down, slightly cruelly, to “Edgar Allan Poe becomes a crime-fighter”, but the lion’s share of the film is him attempting to rescue his fiancée and capture the killer who’s using his work as inspiration. This film got some bad reviews. 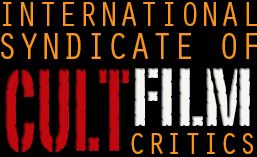 21% on Rotten Tomatoes, not much better on Metacritic…you know what? It’s not terrible. I mean, Cusack’s performance is a bit misjudged (and he’s a rather handsome, dashing fella, whereas Poe was a bit lumpy and weird-looking: you get the feeling Cusack’s Poe could have talked himself into many a bedchamber) and the ending’s a bit of a bummer, but it’s one of those films where I’m not sure I could put my finger on why it doesn’t work. Which renders the last several paragraphs rather pointless, I suppose. Don’t worry, dear reader (or if this page gets more than one hit, readers), I promise I’ll at least try to get better at this. There’s no one main reason, just a vague sense that more could have been made of it. EDIT: I’m really going to try and find something either very bad or very good on my next trip to Poundland. I may return to the giant shark reviews of my younger days. Reader(s), any ideas?